As 2018 winds down, Dr. Sally and her staff have been busy. One of the presenting complaints we had throughout the year was that some of our patients were not eating well, had foul breath and painful mouths. Upon examination, Dr. Sally diagnosed the patient with dental disease. Many owners wonder how dental disease begins. Bacteria in the mouth forms plaque, which then attaches to the surface of the teeth. 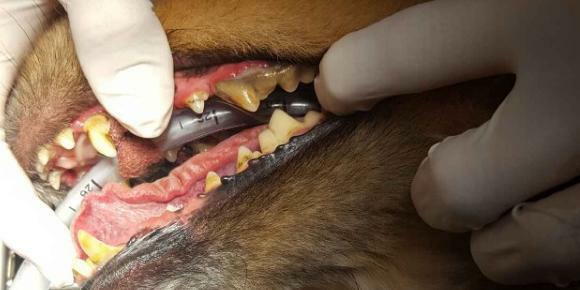 Tartar begins to form when minerals in the pet’s saliva harden the plaque. This eventually sticks onto the animal’s teeth. While tartar can be noticeable to pet owners, it is not the cause of periodontal disease. When plaque and calculus begin to go underneath the gum line, bacteria can damage the tissue that supports the tooth. This can lead to permanent tooth damage and the need for extraction. This can be painful to the dog or cat, causing them to not want to eat. Sadly, many animals continue to eat with their painful mouths, and the condition goes unnoticed by their loving family. The bacteria under the gum line secretes toxins, which can cause tissue damage if left untreated. Also, it can affect an animal’s immune system. Most of the time, periodontal disease includes gingivitis (inflammation of the gums). To determine the severity and location of periodontal disease, we take dental x-rays. These are warranted to observe tissue loss and if a tooth needs to be extracted. Our patients are under general anesthesia during a dental cleaning, as well as dental x-rays. While our technicians are performing the x-rays, we also have a dental chart to document the patient’s teeth and even do pocket depth measurements. Once a dental cleaning is performed on a patient, we discuss with the owner prevention and treatment. At Mohawk Animal Hospital, we always examine our patients’ teeth to determine when they will need a prophylactic dental procedure. Routine annual exams are a great time to evaluate teeth. We want to perform anesthetized dental cleanings and evaluate periodontal structures prior to permanent damage to your pet’s teeth. Therefore, we will examine your pet's teeth during the office visit, and when there is visible tartar/calculus accumulation, we may recommend a dental procedure. Home oral hygiene such as water rinses and additives, oral diet food and dental treats can improve the periodontal health of a patient. Owners can even brush their pet’s teeth. Frequent mouth checks at home at least once a month also are recommended. Dr. Sally Chevalier and her team at Mohawk Animal Hospital are happy to help answer any questions or concerns you may have!